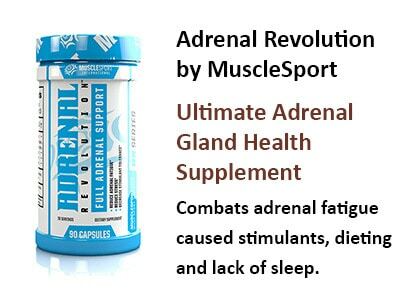 Adrenal Revolution by Musclesport is ideal for those who want to improve the function of their adrenal gland. Too much adrenaline running through your body is not good and can cause stress. Adrenal Revolution is designed to help lower your stress levels and the strain your adrenal glands are under each day. The unique combination of ingredients is what makes Adrenal Revolution a must have for those who hit the gym regularly. The effects of adrenal fatigue can be disastrous if ignored. High levels of fatigue, a weakened immune system, and depressed hormone production can put a serious damper on your fitness goals. The health of your adrenal glands is absolutely vital to your well-being and overall performance. They play a huge role in producing the hormones we need, particularly during times of stress. Rigorous training and cardiovascular activity tends to strain the adrenal glands and may prevent them from functioning optimally. Add in the effects of dieting, not enough water or sleep, caffeine, the stimulants found in pre-workouts and adrenal function may be impaired further. This can leave your weight loss at a standstill. Because strong adrenal support is key for athletes on multiple levels, MuscleSport developed Adrenal Revolution; a full adrenal support formula that can help reduce adrenal fatigue, minimize stress and decrease stimulant tolerance. Ashwagandha Root – helps the body deal with physical, emotional, and psychological stressors. The MuscleSport Adrenal Revolution Australia will help reset your adrenal system and have you performing at your best.